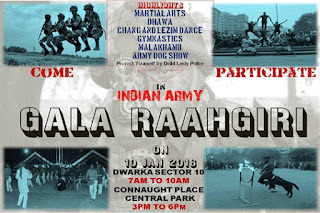 As part of ‘68th Army Day Celebration- 2016’ and in its drive, the Army would be conducting an Army ‘Raahgiri’ with an endeavour to connect with the masses and bring the 68th Army day celebrations closer home to the general public. The Army will be conducting various programmes at Central Park, Connaught Place (3:00PM onwards) and Sector 10, Dwarka (7:00 AM Onwards) on 10 January 2016 (Sunday). The events will focus on the theme of healthy living and will include Martial Arts display by troops of the Assam Regiment and other cultural shows like ‘Lezim’ from Maharashtra and ‘Chang Dance’ from Rajasthan. The events will also showcase the Infantry Soldier’s bayonet training drill, known as “Dhawa”, where the audience would be allowed to participate and win prizes. The Army Dog Squads will be showing off their military training skills. An Army Aerobics and ‘Malakhamb’ team would also be showing elite gymnastics skills and raw muscular strength to motivate the youth to ape a healthy lifestyle. The event would be conducted as a prelude to the Army Day Celebrations this year and would certainly go a long way to etch an impression in the minds of the future generations of the country on the Indian Army's legacy of Courage, Valour and Sacrifice. As part of ‘68th Army Day – 2016’ Celebration, the army would be conducting a painting competition on the theme “Indian Army: Symbol of Courage, Valour and Sacrifice” which would be organised at India Gate Lawns on 09 Jan 2016 from 2:00PM onwards. The online registration for the event was completed on 04 January 2016 and around 750 children are expected to participate in the event. The competitions are being held under three different categories to include ‘Under 12 years’, ‘12 to 18 years’ and for ‘Differently - Abled Children’. The winners would be presented a trophy and cash prize for each category. Apart from this, 15 consolation prizes with a medallion are also being awarded. The event would be conducted as a prelude to the 68th Army Day - 2016 Celebrations this year and would certainly go a long way to etch an impression in the minds of the future generations of the country on the Indian Army's legacy of Courage, Valour and Sacrifice. The event would also encourage young minds towards Army life and rekindle feeling of patriotism among them. Admiral Scott Swift, Commander, Pacific Fleet is visiting New Delhi from 07 – 09 Jan 16. His visit is intended to consolidate the growing defence relations between India and US and also to explore new avenues for naval cooperation. Admiral Scott Swift held bilateral discussions with Admiral RK Dhowan, Chief of the Naval Staff today. He also interacted with the Deputy Chief of Naval Staff and members of the Naval Maritime Foundation. The Admiral has earlier visited India in 2012 and 2013 in various capacities. Adm Swift was promoted to the rank of Admiral and assumed Command of the U.S. Pacific Fleet on 27 May 15. He is the 35th Commander since the Fleet was established in February 1941 with Headquarters at Pearl Harbour, Hawaii. The Indian and the US Navies cooperate with each other in terms of technical training, anti-piracy patrols, Navy to Navy staff talks, bilateral exercises such as MALABAR, as well as interact at various multilateral forums like RIMPAC. Warships from both navies call at each other’s ports,which provides excellent opportunity for professional interaction and building ‘Bridges of Friendship’ . With the ongoing construction of Indigenous Aircraft Carrier (IAC 1), carrier construction cooperation has emerged as one of the major areas for cooperation between the two navies. Major issues that were discussed during the visit included enhancement of scope and complexity of exercises, training exchanges, improving MDA by sharing of white shipping information and participation of USN in the prestigious International Fleet Review being organised by Indian Navy off Visakhapatnam in Feb 16.